"He would talk about his hitmen, he would talk about how he could have people hurt or killed." 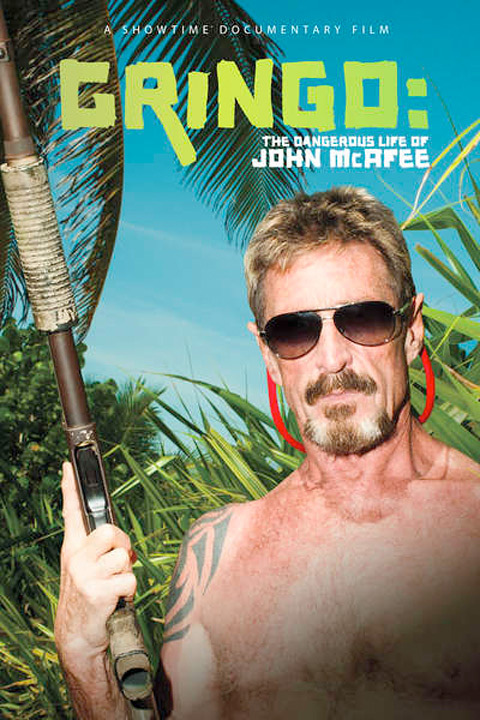 Showtime has debuted a trailer for the documentary Gringo: The Dangerous Life of John McAfee, from director Nanette Burstein, which is playing at the Toronto Film Festival now. You probably remember hearing about this story - John McAfee, founder of the popular anti-virus software that bears his name, was accused of murdering his ex-pat neighbor in Belize in late 2012. He escaped the country and was eventually deported back to the United States, but never charged. The doc examines the story and the wild side of McAfee, and reviews from TIFF indicate that this shows he was involved in not one, but two, murders. This looks crazy. Documentary about the bizarre and scandalous life of tech millionaire John McAfee -- famed inventor of anti-virus software -- who goes off the grid to live in Belize, building a compound and harem, becoming a drug lord and developing an armed security force to guard himself against the police until he is a suspect in his neighbor's murder and must make a great escape. Gringo: The Dangerous Life of John McAfee is directed by filmmaker Nanette Burstein, of The Kid Stays in the Picture, American Teen and Going the Distance previously. The doc just premiered at the Toronto Film Festival this month. Showtime will debut the documentary on VOD + on TV starting September 24th. For more info, visit their website. Interested? Looks like an intriguing tale, thanks for the heads up Alex. Man, I've always wondered the story behind this dude. I just hope it's an even handed take, not a one-sided journey. Sometimes truth is stranger than fiction and between madness and genius indeed! Hard pass on this one. This dude is a sicko. Only thing to note is that Nanette is not "launching her career". She is already an established, experienced filmmaker who is just looking for good stories to tell. It's a bit insulting that this previous blog claims she is launching her career off of this, that pretty much undermines her entire experience and filmography beforehand. Which includes an Oscar nomination for a Feature Documentary. Her career is already launched and has been for years. When you make a documentary on a living person, that could have huge implications on his reputation, wouldn't it be common sense to give this person a chance to give his pov on the story and to bring contradiction to the alleged testimonies? It will be up to the viewer to make his mind on who's right and who's wrong. Otherwise, it's just a bashingmentary. Sure, but people like this might be liars who will defend themselves at all costs. Take, for example, the Weiner documentary. Good doc, but then in light of the recent news of more trouble, you wonder if he was really being truly honest in that doc or just playing along to make himself look good and shift blame/turn himself into the victim. That's the ransom to pay if we want to be fair. Everyone is innocent until proven guilty. If we don't apply this principle in journalism. We will corrupt the profession. A serious investigation must follow an unbiased methodology, and look after "proofs", not "he said. She said" testimonies. Good point. I think that you will have the opportunity to watch it before me. So please give us a review when possible.